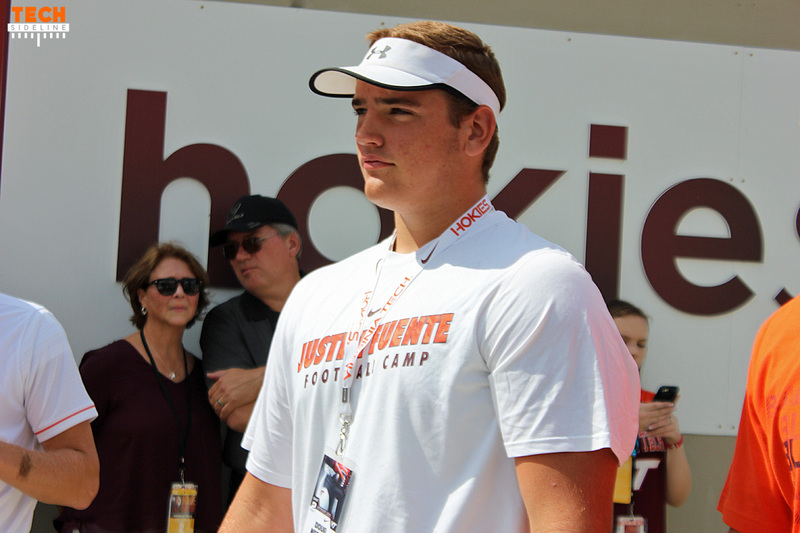 Highly-touted four-star offensive lineman Doug Nester, who has been committed to Ohio State since August of 2017, has signed instead with Virginia Tech. The news was reported by Grant Taylor of the Huntington (WV) Herald-Dispatch. Nester received his Virginia Tech offer in July of 2016, and he verbaled to Ohio State approximately 18 months ago. But with Urban Meyer’s retirement, Nester reopened his recruiting. His top choices other than Ohio State were Penn State and Virginia Tech, and the Hokies won out. Nester and Bryan Hudson rank No. 1 and No. 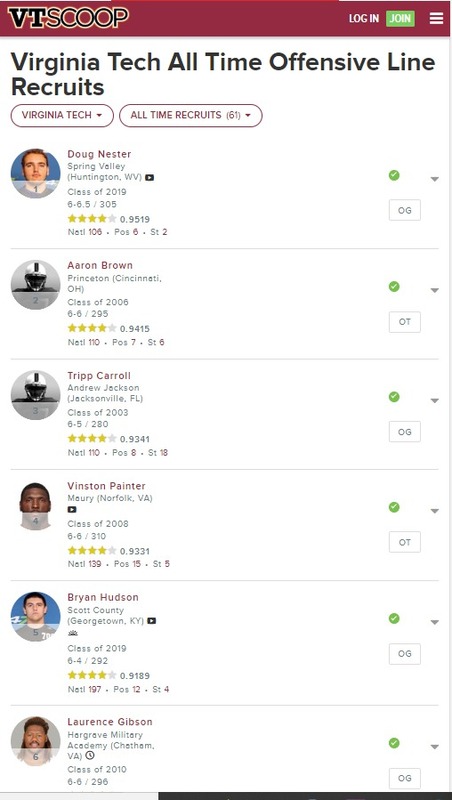 5 respectively of all offensive line recruits in Virginia Tech history, per the 247 Composite rankings, and both had a huge number of major offers from schools around the country. Nester: No. 108 nationally, offers from Alabama, Ohio State, Penn State, Florida, Georgia, and others. Hudson: No. 197 nationally, offers from Alabama, Florida, LSU, Georgia, Notre Dame, and others. Virginia Tech is also recruiting Coastal Carolina offensive lineman Brock Hoffman, who has entered the transfer portal and would be eligible to play in 2019. For more on Signing Day, check out TechSideline.com’s Signing Day Central. Congratulations, and Welcome HOME Mr. Nester..Go Hokies!!! me to be a bundle of personality..
but I wanted to state it! ‘Away from all the bad stuff.” Love it. Welcome Doug. You will love the game day atmosphere in Lane Stadium! Y E S , S I R ! , , , Y E S ! S I R ! and Mr. and Mrs. Nester. it’s a much shorter trip to the ‘burg than tohios. So, if Nester and Hudson are ranked #1 and #5 in VT OL recruiting history, who are the other 3? I’m assuming one was Tripp Carroll, who busted. He was a converted TE. His draft was a big surprise and blew up once in the NFL. Render? Also the other guard that we got from Georgia but ended up with knee issues (sorry, memory gone). Here’s the list of the top 6: Nester, Aaron Brown, Tripp Carroll, Vinston Painter, Bryan Hudson, Laurence Gibson. no offense to anyone, but how did we pull nester and hudson? If you omit last year which was complete devastation of talent and experience mainly on defense, Fuente and his staff have brought a new excitement to Blacksburg. Casting a much larger net for recruits than FB did. Defensive players have always liked our agressive scheme and special teams success. Offensively, Vince Vice is apparently an excellent, passionate recruiter who is showing love and excitement to these kids. Hey, I would choose Blacksburg Virginia over Columbus Ohio any day of the week! Absolutely thrilled over this recruit. I’ve been waiting for years to see us with a really great OL. This is a huge catch and we welcome him with open arms to the Hokie Nation!!!!! Welcome Home Doug!!!! Beautiful! Be nice to see these guys smash that Clemson Dline in the ACCCG in 2020! How about just being competitive with the costal champion for starters?. And not losing to Miami by 28. OK, a “small little Huntington” that works for me. Works for all of us. Use that line for other players we could want from there. On paper, this may be our best offensive lineman haul in years. Time will tell!